This is a sign on the tube in a space where proper advertising could go, so you know it’s serious. It’s a funny angle, but I really didn’t want to have to shift on a busy train to try to get the perfect shot – it does the job. Really, how has this ever been an issue? 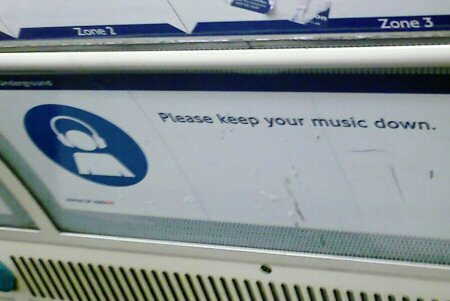 I can’t believe whoever came up with the idea of putting this sign on an underground train has ever been on the tube, let along been on it with an iPod. If you can hear anything out of your own headphones, you’re doing well, nevermind how you could possibly be concerned about a little sound escaping from someone wedged next to you. This is especially with European model iPods with the volume cap that’s imposed on everyone because of some stupid French law. My old Creative MP3 player came from the USA and I could hear OK it at three notches below top volume at full speed on the Circle Line. Whereas my iPod nano bought in England didn’t stand a chance until I invested in some noise-cancelling headphones. The volume cap surely does make it harder to deafen yourself if you really can’t tell when it’s too loud (clues: ears ringing, bad; ears bleeding, very bad) but just like the law that prevents you buying more than a handful of painkillers at time so that it;s more difficult to kill yourself if you don’t realise it’s wrong to take a whole bottle, it’s just a bloody nuisence.